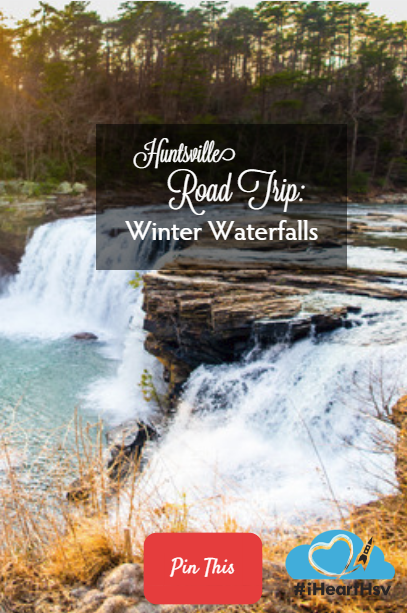 Fueled by winter rains, winter and early spring are the best time for viewing North Alabama’s many waterfalls. 3 of the best ones are within 90 minutes of Huntsville and FREE to visit. Plan the ultimate road trip by enjoying all that these stunning outdoor spaces have to offer and then heading to Huntsville to explore the U.S. Space & Rocket Center, fantastic local dining, unique public art, and much more. Dropping 90 feet into a ravine, this waterfall on Black Creek is in the heart of Gadsden, AL, and scenic 90 minute drive east of Huntsville. Access to the top of the waterfall is free with ample parking and accessible sidewalks. 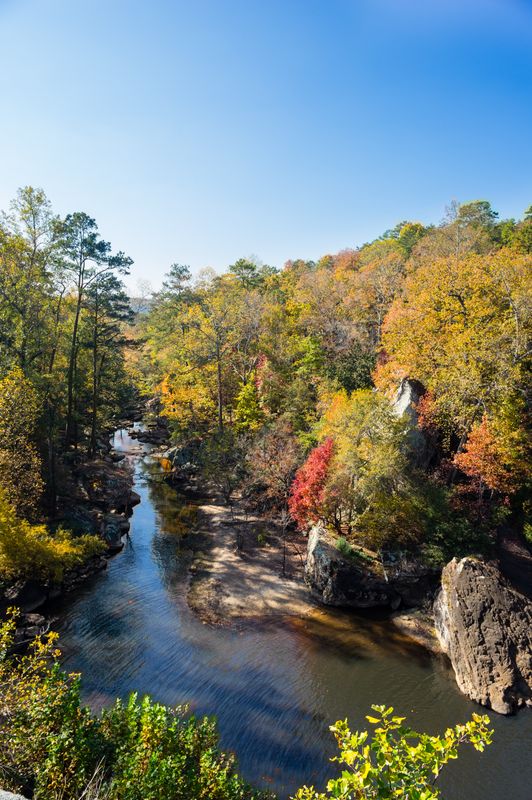 To hike to the bottom of the waterfall, you’ll admission to Noccalula Falls Park $6 for adults, $4 for seniors and children, and free for children under 3. Take the easy to moderate Black Creek Trail down into the ravine. While there, the Park has mini train rides, a petting zoo and mini golf. When hunger strikes, authentic, affordable and delicious Thai food can be found right across the street at Kati Thai. If you want to add some hiking to your trip, park on the north side of the waterfall and walk past the campground. The Park has a well-marked hiking trail network that is free use. 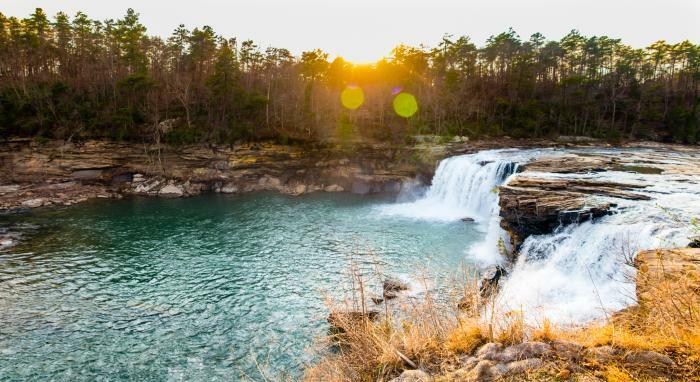 At 104 feet, DeSoto Falls is one of the tallest waterfalls in Alabama. Park of DeSoto State Park, this waterfall is on the Little River near Mentone, Alabama, 90 minutes east of Huntsville near the Georgia border. The DeSoto Falls site is open daily and free to visit with ample parking. For more views, there is the short .6 mile DeSoto Falls Canyon Rim Trail. 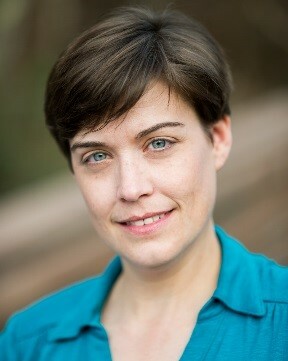 A picnic lunch is recommended, or drive into Mentone to eat at the Wildflower Café. Memorial Day through Labor Day, kayak and canoe rentals are available to explore 2 miles of serene flat water. Inside the Little River Canyon National Preserve, the 45 foot waterfall is wide and powerful in the days after it’s been wet but this section of the Little River is beautiful year-round. Close to DeSoto Falls, you can easily visit both in one side trip. Access to this area is free. The Preserve offers and 100 car parking lot and an accessible boardwalk to multiple views of the falls. The moderately difficult ¾ mile Martha Trail is there for the more adventurous. 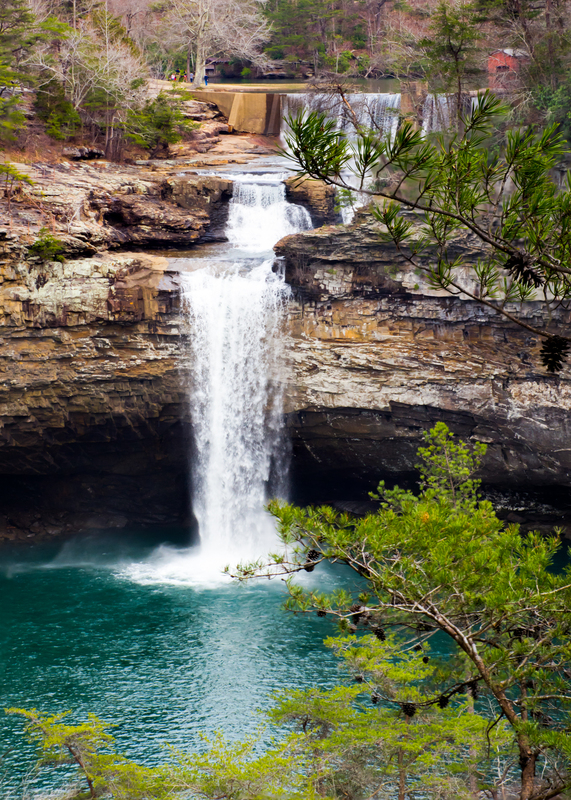 BONUS: Get more information and learn about other North Alabama waterfalls here.